Over The Range Microwaves, Are They a Good Option? Oh that rectangular masterpiece of modern convenience that has made its way into almost every kitchen across the United States – the microwave. Microwaves have become a kitchen staple and for many people, they couldn’t live without them. Now available in almost any color under the sun, with more features than a new car, how could you possibly not have one? 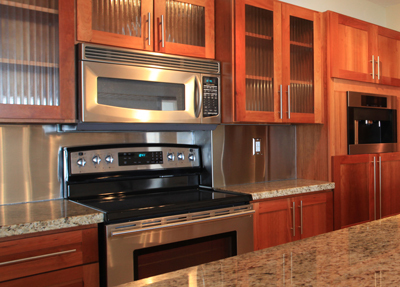 A popular location for the microwave is over the cooktop or range. They even have a nifty acronym for them – OTR (over the range). While on the surface it might sound like a good idea, lets take a little closer look. The number one reason people place the microwave over the range is to save space. There is no denying it, by placing the microwave there, you do not take up counter space, but at what cost? By placing the microwave over the range, you need to have a unit capable of ventilating the area. The issue with microwaves is they are designed to be a microwave first with the ventilation system added onto them. The kitchen is one, if not the largest source of air contamination in the home. If not properly ventilated, the indoor air quality of your home will be compromised. A range hood is deigned to do one thing and do that one thing extremely well – ventilate. Often times the microwave is installed to re-circulate the air through a charcoal filter. If you ask anyone who deals with indoor air quality, they will tell you that this is not an acceptable way to “ventilate” the kitchen. In some locations across the United States it is against the building code to install a recirculating unit – it must vent to the outside (this includes recirculating microwaves as well as recirculating range hoods). The perception of OTR microwaves is that they are more convenient from a space savings perspective, but are they? Consider the installed high of the unit. The top of the range is typically 36” (3 feet), the unit is installed 24” to 30” above the range. That brings the bottom of the microwave to a height of a minimum of 5”. That means that for most people, they will be reaching up to get items out of the oven. For anyone under 5.5 feet, they will probably need a step stool to get items in and out. This can provide a convenience and safety issue. Think about children trying to reach up to get something hot out of the oven or do you really want a cup of hot tea being pulled out of the oven and held over your head? Back to the effectiveness of the ventilation, another issue with OTR microwaves is the depth of the ovens. Typically they are about 15” deep. This allows them to basically match up to the front of the cabinets or just stick out a little bit. While this might be nice from a visually pleasing standpoint, it decreases the capture area of the hood. Most cooktops are 24” deep, so with an OTR microwave there is typically about a 9” difference is depth. Range hoods are typically 18” to 24” deep allowing them to capture considerably more contaminants coming off the cooking surface. As with any larger purchase in the home, especially one that will be installed, there is always a need to weigh the pros and cons and make the best decision for your particular need. To learn more about Air King’s range hoods and indoor air quality solutions, visit www.airkinglimited.com.